TeenCanteen, who are Carla Easton (lead vocals/synth), Chloe Philip (guitar/vocals), Sita Pieraccini (bass/vocals), and Deborah Smith (drums), recorded their forthcoming album with producer Stephen Watkins at TAPE Studio, Edinburgh. Supported by a devoted and ever-growing fan-base, the recording and release of Say It All With A Kiss was made possible by a successful PledgeMusic crowdfunding campaign. TeenCanteen are L-R: Chloe Philip (guitar/vocals), Deborah Smith (drums), Carla Easton (lead vocals/synth) and Sita Pieraccini (bass/vocals). Photo credit: Kat Gollock Photography. A rousing and harmonic prologue fires straight into defiant rock banger ‘Sister’ as Say It All With A Kiss gets off to a strong start. Easton’s vocal explores a wide range and compliments the pace of the track as glittering synth notes and crashing drums bring ‘Sister’ to a close. The undercurrent of synth is present throughout Say It All With A Kiss featuring on pop sing-along ‘Kung Fu Heartbeats’ and on the harmony-laden and atmospheric ‘Friends’. The influence of established Glasgow synth acts like CHVRCHES and Prides is evident, as well as others in the rock sphere, such as the heavy harmonies of Honeyblood and pop-complexity of Django Django. Latest single ‘How We Met (Cherry Pie)’ utilises classic three-part harmonies and minimal instrumentation to cut to the gooey core of TeenCanteen – sweet, sticky and joyful. There’s still enough room however for their trademark shimmering synths and driving backline provided by the drums of Smith and Pieracinni’s bass. ‘Dancing (Hey You)’ offers the album some shade, yet it very much stands out with it’s bending guitar notes and dramatic soundscape. Lyrically it explores the topic of love from a more twisted and dark angle, “sweet thing, giving me the kisses causing ulcers”. Amongst the synth-pop joyfulness, what Say It All With A Kiss does well is it throws up a little surprise just when you’re least expecting it. 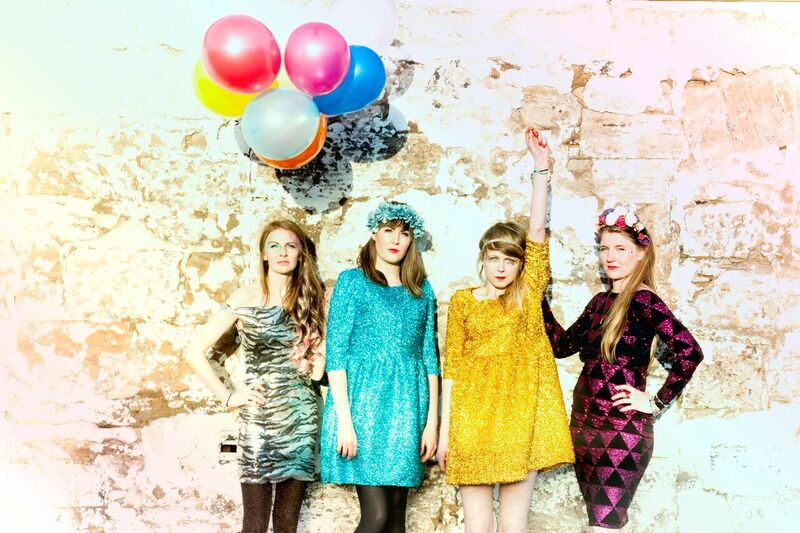 Whether it’s The Cairn String Quartet that feature on the playful and juvenile ‘Roses (My Love)’ or the dramatic and poignant string-led interlude ‘Symphony For The Kids’, TeenCanteen have been able to tastefully collate the best elements of their musicality to create an interesting, diverse and spirited soundscape. ‘Motorbikes’ and ‘Sirens’ are late album treats that feel heartfelt and reminiscent, showing yet again another side to TeenCanteen’s songwriting. It’s really hard to fault Say It All With A Kiss, overall it’s a nicely balanced album. TeenCanteen perfectly blend light and shade, understand the pace of a record and explore the depths of their musicality whilst still being mindful of staying true to their pop roots. Singles like ‘Honey’, ‘Sister’ and ‘How We Met (Cherry Pie)’ have been written and produced expertly and simply sound massive, while the LP brings up a few surprises and nice rest bites from the mayhem in the form of gentle prolugues, interludes and preludes. TeenCanteen will release Say It All With A Kiss via Last Night From Glasgow Records on Friday 9th September following the launch night Thursday 8th September at Mono, Glasgow.